Most people have heard of a will, and know that its important, yet 64% of Americans do not have a “Last Will and Testament.” There’s many reasons people do not have a will, which may include: not fully understanding what a will is, a lack of desire to make a will, the belief that creating a will is too expensive and unnecessary for smaller estates, or even for superstition, less and less Americans have a will each year. Although we do not like to think about death, especially our own, having a properly created will can save your loved one’s heartache and hassle after your death. Will: A legal document that expresses the last wishes of the decedent. Decedent: Someone who has died and whose possessions must be distributed. Estate: All the property or assets, including but not limited to real estate, money, stocks and bonds, heirlooms, and even debt that must be paid before property can be distributed. Testator: An individual who created a will. Heir: Someone who inherits from another on that person’s death. Devise: Giving a gift upon death. Codicil: An addendum to a will that modifies a will after it is created. Executor: An individual who administers the estate either according to the will terms or state statute. Intestate estate: An estate that does not have a valid will. Estate administration: The process of distributing a decedent’s property to new owners. Isn’t estate planning only for elderly people? Wills are not only limited to the elderly. In Florida, under Florida Statute § 732.501, emancipated minors or anyone over the age of 18 and “of sound mind” can make a valid will. A potential issue arises, however, when someone with diminished capacity, i.e. Alzheimer’s Disease, would like to make a will. In Florida, the mental capacity required to make a will is less than the mental capacity to engage in other types of contracts. Since “testamentary capacity,” or the mental capacity required to create a will, is measured from when the will is actually created, only a “lucid interval” is required for an individual to create a will. In American Red Cross v. In re Estate of Haynsworth, 708 So.2d 602, 606 (Fla. 3d DCA 1998), the Florida court articulated that, “[a] ‘lucid moment’ is a period of time during which the testator returned to a state of comprehension and possessed actual testamentary capacity.” However, a will may potentially be held invalid in a dispute if it is determined that either an undue influence was exerted on a testator by a beneficiary or the testator was not “sound mind” when the will was “executed,” or finalized. What are the basics of executing a valid will in Florida? Although there are no specific or “magic words” required to create a will or codicil, strict formalities must be followed to create a legally binding, or enforceable, will. In addition to the capacity requirements, discussed above, the will must be (1) signed by the testator and two witnesses and (2) notarized. In Florida, (1) both witnesses must actually watch the testator sign the will and the testator and (2) each witness must be watched by the testator and the other witness while signing, or “attesting” to the will’s validity. Lastly, a will must be notarized before it will be considered legal and finalized. What happens if I die without a will in Florida? If you chose not to make a will, your will is not fully dispositive, or if your will is determined to be invalid, all or part of your estate will be considered an “intestate estate,” and subject to state intestacy laws based on the decedent’s “presumed intent.” In fact, under Florida Statute § 732.101, even if you have a legally valid will, anything that is not devised in the will passes via intestacy. Intestacy follows a distribution hierarchy of distribution to determine who will inherit. Spouses and children or direct descendants, are considered first; if there are no descendants, parents, brothers and sisters, grandparents, nieces and nephews, and even step-children will all be considered as potential heirs. However, if a probate court cannot find a statutory heir, the entire estate will “escheat” or be absorbed by the state government for the benefit of the State School Fund. Contact us today to talk with an attorney about your estate plan. Even if you decide to change your mind, a will does not become effective until death. This means that you can change or even revoke a will. 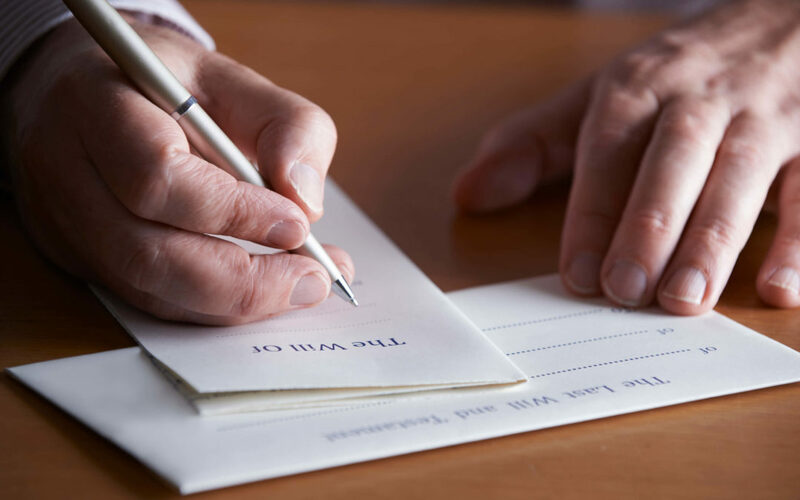 Creating a will is important, and to ensure that a will is legally enforceable, it is best to consult an attorney to assist you in drafting your final wishes. Contact us today to schedule a free consultation and estate plan review with one of our attorneys. During our consultation, we will review your estate planning goals and discuss options with you that may allow for you to achieve those goals. Edited by: John Richert, Esq. and Patrick Quarles, Esq.